While Paria Canyon and Buckskin Gulch offer a world-class canyoneering experience, the Coyote Buttes and the Wave offer a completely different experience. Here you will be hiking at large through the open desert, with no trails, no water sources, and no shade. It is generally easy walking and day use only, but you must be able to find your way, carry all the water you will need, and be prepared to deal with extreme desert heat, late spring to early fall, and extreme cold in the winter. 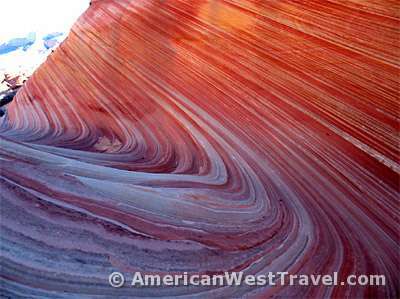 The famous Wave formation, one of the world’s most well-known and surreal landscapes, is located in the Coyote Buttes North district. It is what most people come to see, not just because of the Wave’s fame, but it also is a fairly easy hike (three miles each way) and access to the trailhead is easy in dry conditions. The Coyote Buttes South district is far less known and far less visited than the Wave. However the formations are equally exotic, oftentimes more intricate (particularly in remote Cottonwood Cove), compared to the Wave and Coyote Buttes North. The problem is the difficulty of access. Most of the time, it requires a high clearance, four-wheel drive vehicle, as well as an experienced driver, to reach Paw Hole or Cottonwood Cove. The remote access roads have deep sand and high centers in many places. However it is a highly worthwhile experience for those who can manage it. From the parking areas, there are no specific destinations or hiking routes. You simply pick a formation, walk out towards it and explore, and be amazed. The terrain is largely flat and open so it’s unlikely that you would get lost, Just be sure to look for landmarks in the vicinity of the parking areas. Photo, right: Part of the Wave in early morning, half in sunlight and half in shade, shows highly contrasting and beautiful colors. Your destinations in Coyote Buttes are sandstone reefs (or islands) out in the open desert, which have been sculpted into an amazing variety of colors and shapes (like Waves, Hoodoos, Teepees, etc.) over the eons. Nearly 200 million years ago, this region was a sandy desert where huge dunes migrated across the landscape pushed by seasonal winds. Over time the dunes petrified into solid sandstone, and were sculpted into today’s formations by wind, water, and weather. The many different patterns and cross-bedding (layers) are the result of changing weather patterns and prevailing winds over the eons. The spectacular ribbons of various colors at the Wave and other places, called Liesegang Bands, are the result of changing minerals over time in the precipitation and groundwater. Our Guide offers detailed information for hikers wishing to visit Coyote Buttes North and the Wave, and Coyote Buttes South. See below for printable maps and trail guides, road access information, links and information for permits, and detailed narratives from my personal experiences in each place. 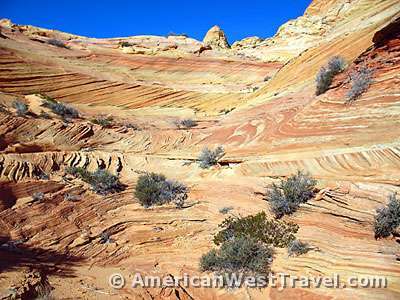 Photo, left: An amazing array of intricate patterns in Cottonwood Cove, Coyote Buttes South. This sheer sandstone hillside represents millions of years of history. As the weather and wind patterns changed over the eons, so did the intricate erosion patterns. This is certainly as exotic as the Wave, just much harder to reach, and therefore little-known. Bureau of Land Management (BLM) hiking permits are required to visit the popular Coyote Buttes, including “the Wave” (official BLM website for Vermilion Cliffs National Monument). Permits are issued for twenty individuals per day for both Coyote Buttes North (site of the Wave) and Coyote Buttes South. It is extremely difficult to get a North permit, as many people want to see the Wave. BLM holds an online lottery for half the permits (ten per day) several months in advance. The other ten per day are reserved for walk-ins. An on-site lottery is held for these permits one day in advance. Permits are generally available for the more remote Coyote Buttes South. Useful contacts: Main office, St. George, Utah (435-588-3200), Kanab, Utah, field office (435-644-4600), Paria Permits Desk (435-688-3246). Paria Contact Station (closest to trailheads, where you should check in) is on US-89 about ten miles west of Big Water, Utah. It is open mid-March to mid-November. Alternate contact is Kanab, Utah BLM field office which is also the site for the daily walk-in lottery. Access to Coyote Buttes is via the House Rock Valley Road (BLM-1065) which heads south from US-89 about 40 miles south of Kanab, Utah and 35 miles north of Page, Arizona. The road is passable by 2WD vehicles when dry, not recommended for any vehicles when wet. High clearance vehicles are suggested. Coyote Buttes North and the Wave are accessed from the Wire Pass Trailhead, 8.3 miles south of US-89. The Paw Hole area of Coyote Buttes South is reached by the Lone Tree turnoff (BLM-1080), 16 miles south of US-89. Though only 2.5 miles to Paw Hole, the route is extremely difficult due to sand. Cottonwood Cove is accessed by the Corral turnoff (BLM-1017), 19.8 miles south of US-98. The route is moderately difficult. Download our map, Road Access and Highlights, Coyote Buttes, North and South (PDF file) – This fully-printable, color map combines information from several BLM maps and handouts onto one convenient page. Includes the entire unpaved road network between US-89 and AZ-89a, accessing both the North and South units. Also, all mileages, landmarks, access points, and other helpful information. In particular, it shows the exact, preferred route to Cottonwood Cove with access to the most interesting scenery in Coyote Buttes South (the Cottonwood Teepees). Quad map showing the trail to the Wave and other landmarks, as well as landmark photos along the route with GPS and map coordinates. Includes the entire unpaved road network between US-89 and AZ-89a, accessing both the Coyote Buttes North and South units.